everybody, if they're truthfully honest, has a bad day at the office. there are days when getting out of bed in the morning is harder than usual because the thought of another or specific day at work is not the very thing you were looking forward to. there's an evens chance that day will be a monday, but a degree of interchangeability seems built-in, so there might be a choice. the point to watch is when those days gain in frequency, or when disparate days on which the portents of discontent start to join up creating weeks and eventually months of despair. much is made of the fact that ernesto colnago is the first through the doors of the cambiago offices every morning and reputedly the last to leave each evening. ernesto is eighty years old, he's very much in charge of his own company and destiny, but i'd be willing to bet that there has been more than one occasion on which he's told mrs colnago he's just going to have another five minutes in bed and rolled over for more snooze time. having just returned from the scottish bike show at the weekend, aspects of many a conversation revolved round the recognition that many an individual employed in the bike industry is of a remarkably pleasant disposition. the general consensus as to why this was the case was seen to be one of contentment and enthusiasm. there are easier ways to earn vast quantities of money, so generally those associated with bicycles are involved because they want to be. but suppose bikes are not your principal mode of employ or, as in my case, obsession, and that which puts bread on the table is causing you grief on a large scale. what does one do? if you're craig middleton, you start your own bike company. 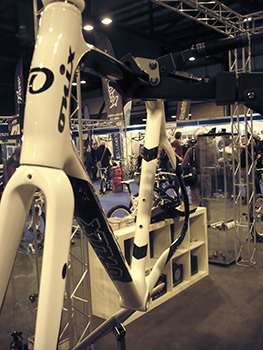 on show at the scottish bike show, for the first time in the flesh (or carbon) were the two onix cycles launched this year with rob hayles' name painted along the side. 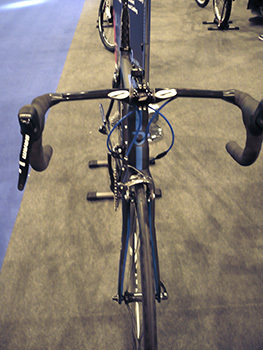 if i'm blatantly honest, the fact that another couple of carbon frames have joined the happy throng is hardly front page news, however, the story behind how they came to be on rowan mackie's grey and blue carpet in glasgow's secc is the stuff of which legends are made. craig middleton is, by trade, a printer, the very sort of chap who stands beside a large agglomoration of cylinders, rollers and litho plates slathered with c,m,y and k inks intent on filling another portion of the world with the product of offset litho. it can be a fascinating world if that's what floats your boat, but for many, including craig, it is that which fills the bank account and somewhere to go each day. so what happened? why, when the world's cycle shows have already succeeded in filling the world with acres of carbon fibre, did craig give up his printing career to join those acres? "i'd worked my way up the line as a printer to the point where i was earning reasonable money and was at the top of my particular part of the profession. But the thought of spending the next 26 years doing the same thing had no appeal whatsoever. So I thought long and hard about what I could do that I'd seriously enjoy doing. And this is it." i seriously doubt that i am the only one with one or two slivers gleaned from those acres sitting in the bike shed, eager to be let loose each weekend and the occasional school night for some energetic perambulations. at some point, the money has to be placed in someone's till, so for all the debates raging about the merits and demerits of each particular brand, it ultimately comes down to that of personal choice. after perusing every advert, review and cycle store display relating to that which you may feel an affinity. there are more than enough choices already on offer, so what is it that an onix does that can't be achieved on a trek, specialized or colnago? "I only wish I had their budgets, so ask me again in a year's time"
with one or two exceptions, the bulk of the world's carbon fibre frame output has taken up residence in the far east: china and taiwan. both those locations are a considerable distance from blackburn in lancashire, so craig's initial contact with regard to every aspect of his prospective future in the cycle industry was conducted by e-mail; asking questions, requesting samples, frame angles and a myriad other configurations. this hardly constitutes the ideal way to put together something of which he admittedly had very little practical experience. 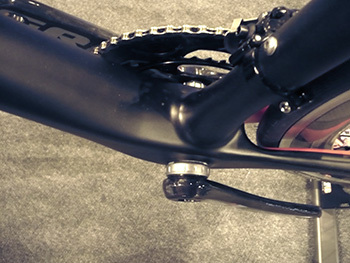 it seems pertinent to ask how much control does he have over the nitty gritty of the onix carbon frame development. isn't much of it in the hands of the chaps in taiwan? "There are a number of plants in China and Taiwan capable of building almost anything you want, and though I understood the intricacies of frame geometry, I couldn't quite visualise the tube shapes until they arrived. So when planning the 2011 range, things took a bit longer than would have been ideal. I just knew I wanted to have them build the very best I could manage in my own rudimentary way. As I said, all the initial dealings were by e-mail where I told them what I wanted and they responded with how that might be achieved. "But the real start came when I finally went out to Taiwan, spoke to the right people and came back with samples which Mike (Jackson, Onix mechanic) and I built into bikes and had tested by a few professional cyclists kind enough to assist. 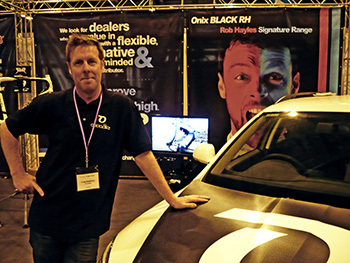 That process has now resulted in the Rob Hayles signature line." carbon, however, is not the darling that it once was. last month i visited the north american handmade bicycle show in sacramento to gaze longingly upon the product of individual endeavour, mostly fashioned from cast lugs and steel tubes augmented by the occasional fillet brazed and tig welded joint. though it has been quite correctly pointed out that even carbon monocoques are largely hand-made, steel is currently at the vanguard of bicycle frame venture, perhaps underlined by the apparent success of bespoked bristol also held in march this year. given that onix is at the contemporary end of contemporary, would it not have been a tad more en-vogue to have offered one or two frames fashioned from steel in place of carbon? "Perhaps you're right, but the idea of building bikes from steel never really occurred to me. Everything in China is set up to deal with carbon; steel isn't a material they're familar with for building bicycle frames. However, I'm not ruling out the possibility that we might think along those lines in the future, if all goes well." bricks and mortar cost much a plenty cash, as indeed does setting up a distribution model. it is somewhat of a tautological statement to point out that having become the proud parent of two rather stunning rob hayles onix bicycles, the only way of making money out of them is to sell, and preferably in vast quantities. 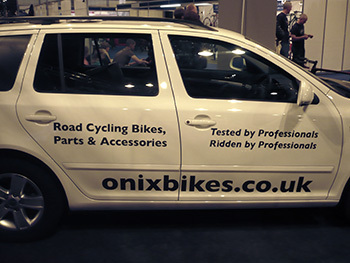 until now, buying an onix of whatever flavour involved ticking the right boxes on the website, but during the scottish bike show, at least three dealers enquired about putting an onix or two in their shop windows. does this mean there might soon be a dedicated network of onix dealers all across the nation? "I set up to be an online retailer only and never really thought about the IBD market. But as you've pointed out, I've already been asked about selling to retail. That's taken me a bit by surprise and means I might have to look at not only my distribution but also the prices. It's not as simple as it might seem." though i have a little in common with craig as regards his former employment - i'm usually the guy producing the artwork for printing - it seems that the land of print may have even less in common with that of bicycle entrepreneur. 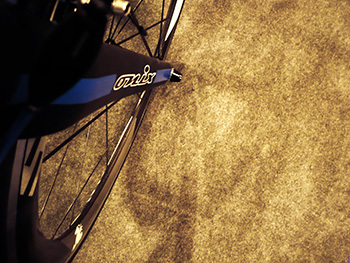 has he found his print background helpful in any way with his foray into the bicycle industry? "not really." the lead up to imposing your wares on an unsuspecting public is that of a directed marketing campaign. this usually consists of ensuring suitable review models are sent to strategic print publications and websites, hopefully for commendable reviews. this would normally be accompanied by full page, colour adverts (there's just no way of getting away from print altogether it seems) ensuring that the great unwashed are completely aware that your latest carbon offerings are now available, at what price and precisely where to get hold of them. but what happens if the money required for such a concerted campaign is non-existent? what if the only way to inform the great and the good needs to be free? this is where craig became a jedi master of how to leverage the power of twitter, the social media, micro-blogging site that costs nothing apart from time. i started following onix quite some time ago, and thought mr middleton to be somewhat full of his own importance. did he figure he was the only guy that had ever set up his own bike company? there were too many teasers that smacked almost of arrogance, and i fear one or two of my ripostes might have been less than generous. however, in mitigation, i tweeted from a point of ignorance (likely why i should have kept my comments to myself); i was blissfully unaware of the story behind onix bikes thus far. however, after a continuing period, i began to realise that not only was he sincere, but had found an excellent voice for onix bikes. i had no idea there was no marketing budget. having made such a happy and consistent noise on twitter, bringing onix to the attention of the masses, has craig found this to be an effective means of publicity? "Starting your own bike business is an expensive undertaking, one that doesn't leave a lot of money for anything else. Unhappily one of those something elses is marketing. I had no budget, so I leveraged twitter to its maximum because it's almost the only option i had." though i should likely keep my inadequacies to myself, craig and i had arranged, by e-mail, that i'd interview him during saturday at the scottish bike show. up till this point, i had not met the man in person, and keen to impress my professionalism acquired over years as a bona fide member of the cycling media (not for nothing did my press pass state lord palmer) i carefully worded what i deemed pertinent questions before printing them to accompany me to the show. however, in the best tradition of the saturday morning shopping list, i left the darned things in the hotel and approached the onix stand nervously unencumbered. neither of us, it would appear, has formality front and foremost, so my lack of prepared questions turned out not to be a serious disadvantage. 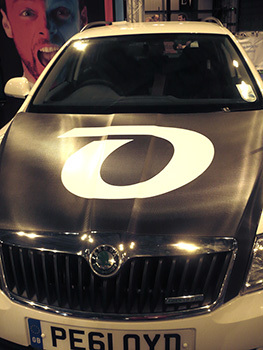 the intention had been to retire to the safety of the costa coffee corner and behave as interviewer and interviewee, but by the time craig asked when i wanted to do the interview, we had already carried out most of the necessary while leaning on the bonnet of the impressive onix skoda. so that's how we continued. i should point out that it took quite a long time to get to this point, for both craig and mike were more often to be found already deep in conversation discussing the latest bikes throughout most of the morning. so did the scottish bike show arrive at just the right time? "Well, it was sort of my official launch. It's the first time anyone could come and look at real bikes rather than photos, and I think I may have underestimated how much of a difference seeing the bikes in the flesh, so to speak, has made to those who came to see them. We sold both display bikes on the first day in Glasgow. "Aside from that, the first batch of frames has now arrived, so we're now in a position to fulfil our orders. From that point of view, being seen in Scotland seems like perfect timing." i have spent many a year riding review models of different bicycles, putting them through my version of their paces, and trying my hardest to give them a hard time. but as i've said so often on twmp, i have never raced and thus have no real concept of how much grief a pro racer can give a new bicycle. or if i have, there's little chance of me doing likewise. however, in the course of offering a professional quality bicycle to an expectant public, it is necessary to ensure it can successfully endure a right hammering. rather obviously, the best way to do this is to have a professional bike racer ride every iteration providing immediate and relevant feedback at every stage. craig has made it known that a number of pro riders tested the latest onix carbon, so how did rob hayles become the name on the top tube? "Rob threw everything into this project, more than I could ever have expected. He rode seemingly endless variations of the frames and forks we were sent, on one notable occasion climbing off after only a few miles because things just weren't right and swapping to another bike from the car. I simply asked him one day over coffee that if he liked the bikes so much, why didn't he put his name to them? To my surprise he agreed. 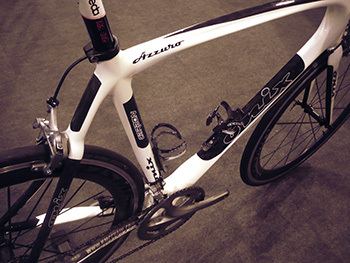 Both he and David Harmon have been major factors in how these bikes and Onix as a company have turned out." 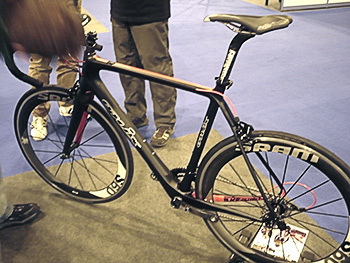 in these days of finite element analysis applied to each and every angle and carbon layer, major corporate investment, sponsorship, advertising, press releases and press conferences, it is very refreshing to find a man with so singular a vision to make his mark and career in the bicycle industry with only a ticket for the cheap seats. the news is not that another marque of carbon has entered the fray; the news is the exciting ride that getting them there has been up till now. it's a story that will last forever, even when, five years from now, team sky are riding onix frames in the tour de france. posted tuesday 17 april 2012.